These days, there seems to be an odd mutual admiration society existing between the British and German vinyl communities. Us Brits tend to find the German quality of engineering, their perfectionism, attention to detail and great sound quality difficult to surpass. At the same time, there are hosts of German audiophiles for whom serious analog means made in the UK - by Simon Yorke, Sme and even the venerable Garrard! Take the inventive Frank Shroeder. You won't find him at home with a 60kg Transrotor behemoth. No, often as not he spins a venerable Garrard 301. Okay you retort, but it's well known that you can put a Shroeder on any decent turntable and, more than most arms, it will make its virtues clear. That's true but misses the point. The Germans actually like our stuff. Unreal, huh? Take the Garrard 501 above: Rectangular wooden plinth, stainless steel housing, direct drive - these guys must be stuck in a time warp. Which, to some extent you've gotta be if you're going to revive the Garrard name. Except, one of the problems with innovation in vinyl of course is that we still find some of the stuff designed a generation ago to be cutting a very sharp edge. And in some very respectable neighborhoods of German audiophilia, Loricraft's Missing Link phono stage has a very high reputation indeed. So let's find out what all the fuss seems to be about. Overall balance may well be vital but for me, the phono stage is the most important element of amplification in an analog setup. After all, it not only has to take the tiny signal a cartridge gives out and amplify it to a much greater extent than your power amplifier does, but it also has got to re-equalize the signal which has been modified during the production of the disc (the standard RIAA curve being the most likely used). As you can imagine, it's not a job to be taken lightly. On the other hand, these challenges make the reviewer's job theoretically easier since audible differences between phono stages are not subtle. Sure, a reasonable phono stage will reproduce music. But unless you have a good one, you might well wonder what all of the often-vaunted superiority of vinyl is all about. Put a top performer into the rig and I've no doubt that any audiophile will easily identify the key differences. Part of the story bears more than a passing relation to the difference in sound between a valve system running from cold and what it sounds like warmed up. If you're curious, try this at home: Switch everything off including the CD or phono stage. Leave it be for a few hours. Then switch everything on again. Try describing what you hear as the system warms up. Here's my take: The muffled, murky quality which robs the system not just of dynamics but blends leading edges and harmonics together, gradually moves towards greater silences, spacial definition and contrast until we are finally able to tell apart small differences in timbre while the energy inside each note expands and becomes denser. We begin to hear a vibrational landscape of inner detail within the notes that previously had been like a flat, color-by-numbers blotch. In other words, we are not talking marginal but basic building blocks of audio reproduction. As with several of the phono stages I've had around recently, the ML comes with a separate 'wall wart' power supply. 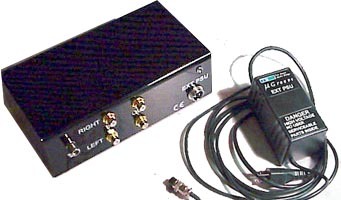 Each of these phono stages uses a long but not high-quality umbilical to connect the various parts. This is bad. It's too easy to have overlong snaking power cords get in the way. True, we need a lot of cable to keep the power supply away from the delicate signal of the phono stage itself. If you buy the unit, you can cut the mains down to length. Still, I would prefer to see a better shielded cable in the first place - plus captive leads mean we can't indulge in expensive cable trials. The power supply itself is a high spec affair bought in from an Italian manufacturer. Nigel, the designer of the Missing Link, believes the engineer behind this supply to be a genius. Each section is discretely rectified, has its own regulators as well as other fancy stuff but still has been extensively modified for the Missing Link partnership. Nigel also points out that it's easy to build a phono stage without hiss but that this almost invariably comes at a cost in terms of absolute dynamics - in my book not a price worth paying. The phono stage proper arrives in a longish aluminium extrusion with a set of gold-plated inputs and impedance selector at one end while the other houses the outputs, umbilical screw socket and a Moving Coil (hi/lo) and Moving Magnet toggle selector. We can already surmise that the designer has gone for as short a signal path as possible; the unit probably measures a mere 8 inches in length [see photo below for relative size to phono record]. The insides are crowded but unusually, there's no circuit board. We get hard- wired, an impressive feature at any price. This Missing Link II came equipped with 5 different loadings (47ohm, 100, 845, 1K,10k), with the 845 provided specifically for the resident Allaerts MC1. I also attached the Music Maker 2 and a modified Benz Glider, among others. With each, the Link was instantly able to reveal the cartridge's individual character, showing that it was not imposing its own interpretation on the proceedings - a good sign already. Straight out of the box, the ML made me one very unhappy camper indeed. "Tin, tin, I've struck a mother load of tin!" "Whoopsidaisy," quipped Hugh Grant without shame from memory. Nigel did forewarn that it would take a couple of days to warm up. Dutifully, I gave it a coupla days; and, not a lot better. Now I'm beginning to schwitz. I like these Loricraft guys, you see? But having committed to the review, am I going to have to dish out a thunderous thumbs down? I remove the offending article from the system and banish it to a distant plug for a month of calisthenics. There's a lot of concern among reading audiophiles that too many magazines and web zines give almost exclusively positive reviews. Since we've got a month to kill, let me dip an oar into these contentious waters. As a reviewer, I tend to chase down gear that I'm genuinely interested in, stuff that's going to mean something to me. I'm actually searching for a decent variable phono stage which becomes an essential tool if you're reviewing cartridges. In any case, actively chasing down a dud and then writing to diss it is not why I for one am into any of thisl Not to mention that writing a negative review isn't all it's cracked up to be unless you had a strong sadistic streak. In fact, I'm far less worried about upsetting suppliers than I am about offending proud owners who might be getting huge pleasure from the piece of kit I'm killing off sweetly. And you never know, in their system, it might in fact give good results. The reason I'd gotten interested in the Missing Link was from recommendations by German audiophile friends and contacts who have nailed things spot-on in the past. Could it be that they'd all gone on a wobbly with this one? Well, a month later things were sounding considerably more promising. My guess is that certain power supplies take a ridiculous amount of time to actually settle down. I rigged up the Missing Link alone, then through the Audio Magic Mini Stealth. As my regular phono stage gets one of the two precious slots on the purifier, it seemed only fair to give the new one the benefit of the same treatment. From the first notes, it was clear that the Missing Link's primary strengths were a lovely plasticity in the way notes were shaped; the ability to read variations of attack, sustain and decay; as well as excellent performance in maintaining this plasticity while still rendering finely the interrelation-ships between notes and instruments. This worked to vinyl's traditional strengths and produced a surprisingly three-dimensional, living sound for a product at this price level. True, we don't get the absolute transparency or inner detail of the Tom Evans Microgroove Plus [left] or its dynamic or rhythmic resolution. Nevertheless, the Link makes for a heady performance that cuts right to the heart of what can make vinyl such a great experience. The Melos Quartet's rendering of Mozart's Flute Quartets [K23535] displayed this phono stage as very keen on the Austrian wunderkind. We got excellent presence and plenty of tone, expressiveness and dynamic subtlety. This was particularly evident in the fabulous cantilena of the "Quartet No. 1 in D, K285" with its haunting flute melody and plucked strings where the ML neatly captured the essence of this fine and delicate interpretation. This was a big improvement on the original reading as reported on by Kelly where he volunteers that "the players were tolerable but not one of them excelled on the instrument he played; but there was a little science among them, which I dare say will be acknowledged when I name them: The first violin, Haydn; the second violin; Dittersdorf; the violoncello, Vanhall; the viola, Mozart." Quite a lineup, this, with the founding fathers of the symphonic format jamming together unplugged! Moving on to Pop, Sade's "Is It A Crime" is a difficult test for dynamics and overhang. To capture those luxuriantly smooth quiet interludes and the explosions of sound accurately while still making musical sense of them is no mean feat for vinyl - and the Missing Link did so with aplomb. Timbre was full and rich, with an impressive density at the expense of some harmonic wealth. The resident Microgroove Plus will produce a soundfield with less grain and therefore greater liquidity and instrumental separation, but it is really difficult for any phono stage to compete with the Evans on those battlegrounds. Bass was fluid, dynamic and neither exaggerated nor recessed. The midband was a particular strength, with instruments believably alive, pulsing in and out of the foreground. The highs were a little restricted but well rendered, harmonics clearly defined as were trailing edges where a lightly picked guitar string's decay came across beautifully. The soundstage proved a little less well defined at the edges and less tonally rich than via the MG+, but the density at the centre was excellent. It's difficult to achieve good rhythm and timing, which has so much to do with the correct emphasis of leading edges without simultaneously washing out harmonics and timbre. The ML favored the rhythmic element whilst still retaining excellent timbre. Just like a system should be balanced in its virtues, every component in it should strive for that goal as well. I've always doubted the point of having incredible dynamics if your component then suffers a tin ear and ends up making a Stradivarius sound like a synthesizer. Or what about great soundstage at the expense of thin-blooded lack of weight? One could go on and on. The Missing Link avoids these pitfalls and does so with authority. The sonic landscape it presents is beautifully judged. Transparent, easily identifiable and separated instruments; poised and involving rhythms; attentive and graceful timing - all this allows the music to breathe and reveal itself on its own terms; typical of the Loricraft/Garrard approach if you ask me. I'm personally not a believer in the variable phono stage as an optimized approach simply because the signal is so delicate that any additional junctures in the circuity are bound to spell trouble. But if you need to go in that direction, the Missing Link is going to be one of the most compelling choices I've heard to date, and a phonostage that can happily be partnered with the finest turntables.